In Islam, Peace, Justice and Democracy is a Lie. America, I hope you are prepared for what lies ahead. A movement to resist, dismantle and destroy the United States as we know it is under way, under the guise of “peace”, “justice”, and “democracy”, but just who is defining what that peace, justice and democracy is? The same individuals and organizations who promote the global agenda, but which group will ultimately win? The Islamists , Communists, and Socialists are all betting they will, and for now are all playing together. It really doesn’t matter who wins, the outcome will be devastating. Ibrahim Sulaiman, a modern day Islamic scholar has stated”Jihad is not inhumane, despite its necessary violence and bloodshed, its ultimate desire is peace which is protected and enhanced by the rule of law.” Peace in Islam is viewed as the result of implementing Islamic law (sharia) which enforces laws to a violent extent. For example, if one were to steal, a punishment could be to cut off a hand. No one wants to lose a hand, so chances are thefts would decline. No crime, equates with a peaceful life. In one sense, Justice is often swift and harsh as a form of punishment. Justice also diminishes freedom of speech and expression, thereby claiming there would be no racial inequalities, or classes of society. Everyone is equal, well, unless you are a non Muslim, and then you are in a lower class. The fallacy of justice in Islam is it only applies to Muslims, so if you want to be treated justly, conversion is necessary. Muslims today use the art of deception (taqiyya) to portray Islam as a religion, rather than a complete way of life dictating every single aspect of your life. Islam today, is just as antiquated, violent and intolerant as it was 1400 years ago when their prophet Muhammad declared himself the messenger of Allah. Today, Islamism, Communism, or Socialism seems like a perfect life for those disenfranchised with America, it’s an easy way out of the ethics and morals carried on for generations in our great nation. Scores of young people today believe working to accomplish goals and live a better live is a product of white supremacy, or privilege. What they dont know is under any of the isms above, their freedoms will be non existent, and so will the life they want handed to them. .Americans must accept the fate that lies before us, and rise. It no longer is if a revolution will occur, it is when. This is a list of Islamic conquests in England that might give you a better understanding of the insidiousness of Hijrah — the takeover of a nation without going to war. Muslim Families … 6-8 children planning to go on FREE benefits/housing and now all UK schools are ONLY serving HALAL MEAT. All this achieved by just 4 million Muslims out of the 66 million population. 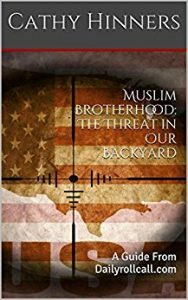 Matt is an author and has written several books, and has a grasp of the Muslim cancer spreading world wide. Here at home, unless we unite now, will be in the same boat Britain is in and it will not be a pleasant future folks for the constitution as we know it will be gone and your women will be wearing burqas’ and the men will be beating the hell out of you. This was Matts comment on the internet. Again , thank Ms Cathy who tirelessly has been enlightening you of this evil to educate you and in all this, no pay but her own head is on the Jihadi’s hit list.